For a 16 Weeks Old pup, the days don’t seem like they will get any easier. Her owner didn’t want her anymore, and so she gathered all of her toys, and her beloved dog bed, loaded her into a car, and mercilessly surrendered her to the Miami Dade animal services. The Miami Dade animal services is not your average shelter to say and write the least. The notoriously high kill facility is grappling with overcrowding, and so “hard decisions” have to be made, to maintain “population control” as one volunteer put it. That means that the dogs and cats trapped inside the facility have just a few weeks and sometimes even just days to find forever families, before they are brought the back, and prepped for euthanasia. 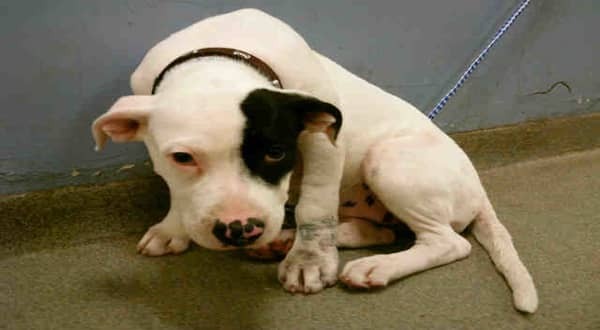 JUNE I am a female white and black American Bulldog mix. The shelter staff think I am about 16 weeks old. She's so terrified she won't move. She shakes in her little corner hoping for someone to give her the home she deserves. This girl needs a hero to give her a second chance at life. 3 Responses to "16 weeks old pup mercilessly surrendered to high kill shelter, trying her best to keep a brave face"
And was a stray, was not surrendered by the owner.